Shortly after the film rights to Doctor Dolittle were auctioned off to Universal Studios, the production studio announced their plans for a reboot of the film. The children's book series was first turned into a film in 1967. The film was later rebooted in 1998, with Eddie Murphy starring this time around. This particular film earned itself two sequels. The planned reboot under Universal Pictures was announced and will be titled The Voyage of Doctor Dolittle, with Iron Man star Robert Downey Jr. set to star, and an April 2019 release. It will be written and directed by Oscar winner Stephen Gaghan. Gaghan has previously written and / or directed films such as Syriana, Gold, Havoc, and Rules of Engagement. 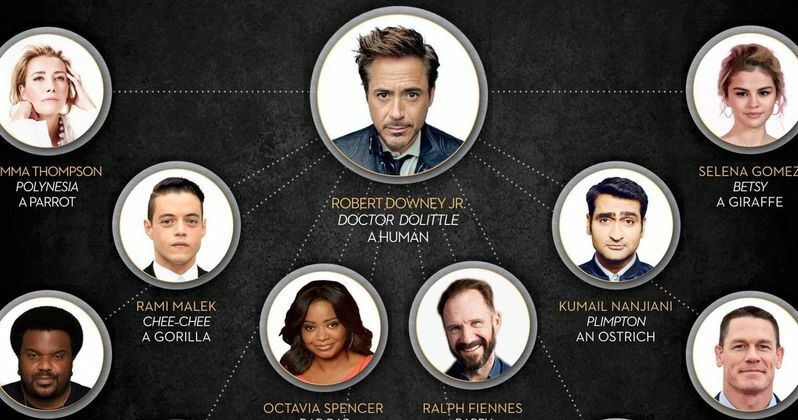 This was all we knew about the film for quite a while, until Robert Downey Jr. recently took to Twitter to reveal the full cast list for next year's film. This star studded cast includes: Robert Downey Jr. as Doctor Dolittle, Emma Thompson as Polynesia the Parrot, Tom Holland as Jip the Dog, Octavia Spencer as Dab-Dab the Duck, Ralph Fiennes as Barry the Tiger, Selena Gomez as Betsy the Giraffe, Craig Robinson as Fleming the Mouse, Carmen Ejogo as Regine the Lioness, Rami Malek as Chee-Chee the Gorilla, Frances De La Tour as "Ginko-Who-Soars", Kumail Nanjiani as Plimpton the Ostrich, Marion Cotillard as Tutu the Fox and John Cena as Yoshi the Polar Bear. This is one serious, promotional bombshell that Universal has dropped. The variation of the cast is absolutely stunning. While some supporting cast members like Tom Holland (Spider-Man: Homecoming) as a dog, Kumail Nanjiani (Silicon Valley) as an Ostrich, and Craig Robinson (The Office) as a mouse are sure to bring out the comedy elements of the film, other cast members like Emma Thompson (Beauty and the Beast), Octavia Spencer (Hidden Figures), and Marion Cotillard (The Dark Knight Rises) bring promise of moving and inspiring characters, and emotion for the film. When the film was first announced, many people were displeased because of how much they loved the Eddie Murphy Doctor Dolittle and didn't want to see the film "ruined" by a reboot. This cast list, however, changes the game. Not only does it look like it will have a much different variety among the cast, but it's likely that the tone will be completely different as well. Eddie Murphy's Doctor Dolittle was more of a family comedy, following Dolittle as he struggled to take care of his family, while dealing with his strange ability to speak to animals. The Voyage of Doctor Dolittle, on the other hand, looks to be more of an adventure movie, with Dolittle travelling to different places around the globe to encounter even more animals. While the film is still more than a year away, the excitement for The Voyage of Doctor Dolittle now seems higher than ever. The cast list announced today shows promise, with a number of Oscar-winners on the list. While not much has been revealed about the plot just yet, the film title, source material, and variety of animals in the "cast" is enough to tell us that Doctor Dolittle will not just be staying at home this time around. You can check out Robert Downey Jr.'s Tweet here.